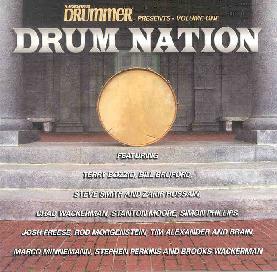 Various Artists - "Modern Drummer Presents Drum Nation Volume One"
I was not sure what to expect but with names like Bill Bruford, Steve Smith, Zakir Hussain, Chad Wackerman, Tim Alexander, Brain, Simon Philips, Terry Bozio and more. The liner notes of the CD are excellent with lengthy descriptions by the drummers of their tracks. Terry Bozio starts the CD with a really cool song, totally unlike anything else on the CD, very experimental with samples and bizarre Buckethead like guitar sounds. Great stuff. Bill Bruford does a reworking of an old song of his and it is pretty straight up boring jazz fusion type stuff. Mad Tea Time P1 and 2 by Steve Smith and Zakir Hussain is one of the highlights of the CD. Fantastic tracks. Chad Wackermans track features an interesting Japanese feel briefly. A pretty boring track overall. Stanton Moore plays a really funky groove with a great brass section to back it up on Sprung Monkey. John Freeze has perhaps the heaviest track. Strange new wavy synth and a hard driving rhythm. It is dedicated to Chris Lagerborg, a close friend that recently passed on. Simon Phillips, produces a pretty straight fusion rock number. I thought the bass playing was really great. The Rod Morgenstein number is just drums and keyboards. It is quite all over the place in the few minutes. Tim Alexander and Brain team up for Shut up and Play yer Drums, a tribute to Frank Zappa and a very cool song. Totally unique. Frank might have smiled briefly. Marco Minneman composed his track while in Maine on an iBook and later played real instruments. This track features some strange off beat rhythms. Pull Up My Sleeve was recorded at Perkisn Palace by Stephen Perkins and Brooks Wackerman and is two successive drum solos. Pretty cool release. Thanks Magna Carta for putting this together!